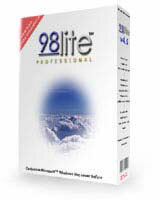 98lite is a selective feature installer for Windows 98, 98SE and Me that modularizes Windows features, applets and sub-systems into optional components that may be user installed and un-installed "on-the-fly". Tailor Windows to your hardware and needs for substantial improvements in performance, stability, and security by removing superfluous Windows code and features you don't want our use. 98lite makes Windows work for you; everything is optional and without risk; previously removed components can be effortlessly added back with a click of your mouse. If you have one of our licenses already you can puchase a single user 98lite license for half price!